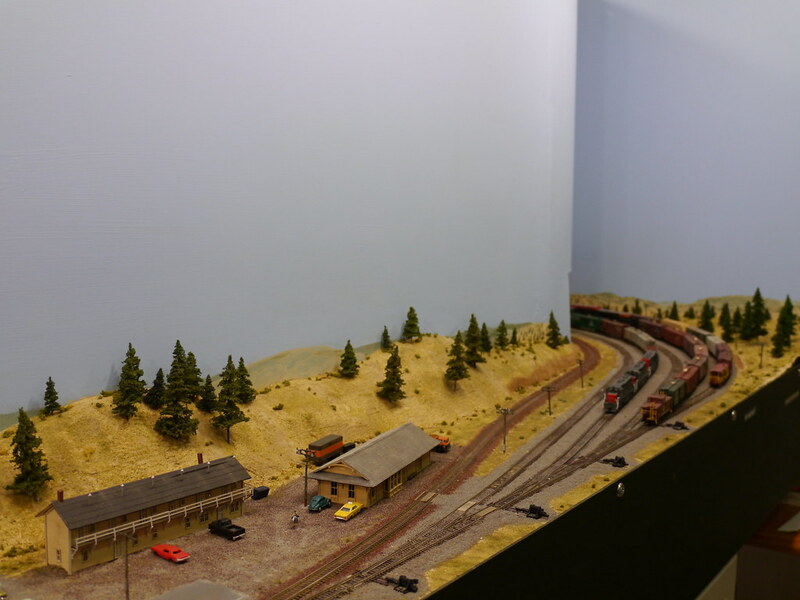 I have been lucky enough to operate their on three occasions, and the layout runs as well as it looks. Not only that, but Dean has developed a very smooth flowing mainline and yard operating scheme that seems to be just enough work without overwhelming even new operators. Overall, its a railroad that we should all aspire to. Thanks Jeff, but with the level of talent on this site there's plenty for me to aspire to as well. When are we going to see an update on your layout - or better yet when can I see it in person? Doug and I talked last night at the Stars game of doing some sort of DFW N scale only weekend, but we don't need to wait for that for you to see the IHB. Just starting scenery now, and just got rights to move into the next bedroom for a staging yard representing Hammond, IN and the steel mills! Whoo Hoo. Great news on the right of way acquisition! A N scale weekend would be great - are you thinking Op's or Tours? 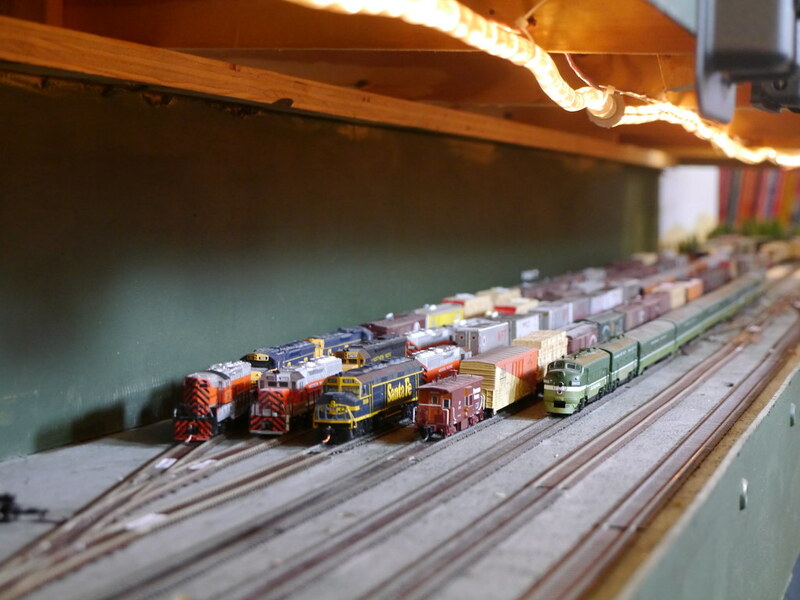 I'm not really aware of any other N scale operating layouts in the DFW area other than you, me, and Ole. Since this is the Layout Engineering Report section, I thought I'd highlight one of my engineering blunders. 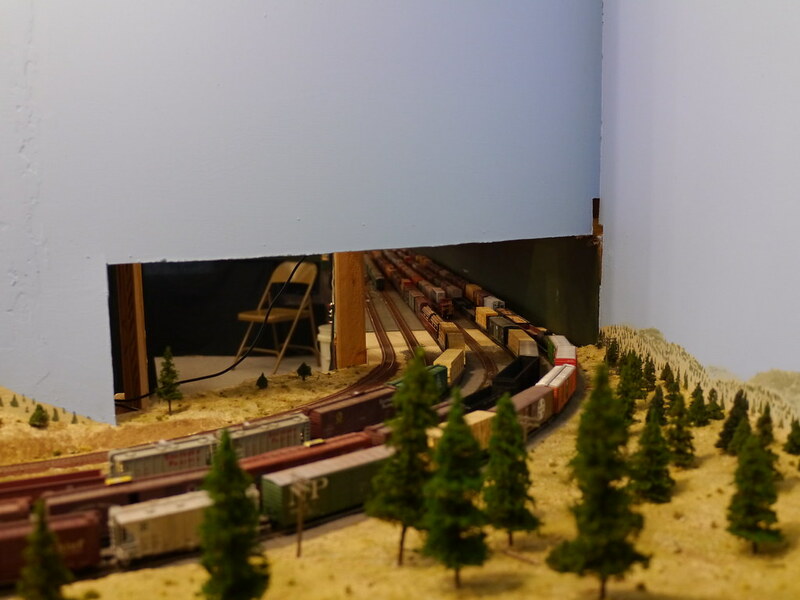 I wanted to have a UP branchline running from a staging track into Silvies Yard appearing on the visible layout via a tunnel. Unfortunately, I somehow made a very signficant error and did not allow space in the benchwork for the staging track. But I didn't want to abandon my plans for the tunnel scene so instead I just modeled the branchline as abandoned track. The still in service portion of the branchline now serves as the Silvies Yard switching lead. Fortunately, I was able to add the UP branchline at the next siding up the line (Emigrant) which gives the UP Local job some switching in the town of Emigrant and some mainline running to Silvies to interchange with the NP. This view also shows some of my Linn Wescott era classic L-girder benchwork before the fascia went up. That doesn't look like a mistake to me! Luv the affect of the abandon branch. I liked it to. Too few model that. But, maybe it looks real because its genesis is that its an unused (now, for whatever reason) line, so it really looks like it went somewhere! Harder to capture that when "planning for abandonment." You hit it on the nose Jeff - I was so happy with the results of the tunnel abandonment, that I decided to add an abandoned logging branch off the Oregon & Northeastern. But it seems like the planned abandonment didn't turn out near as well as if I'd actually laid track and then pulled it up. I haven't decided whether to "abandon this abandonment" or whether to keep it and try to improve it. Dean its nice to see you are on the Railwire. I can attest that your layout is very impressive and inspiring not only in pictures, but in person as well. Let's go back to 2008 for some construction photos. After years of planning for a dream layout, motivation was very high at this point. 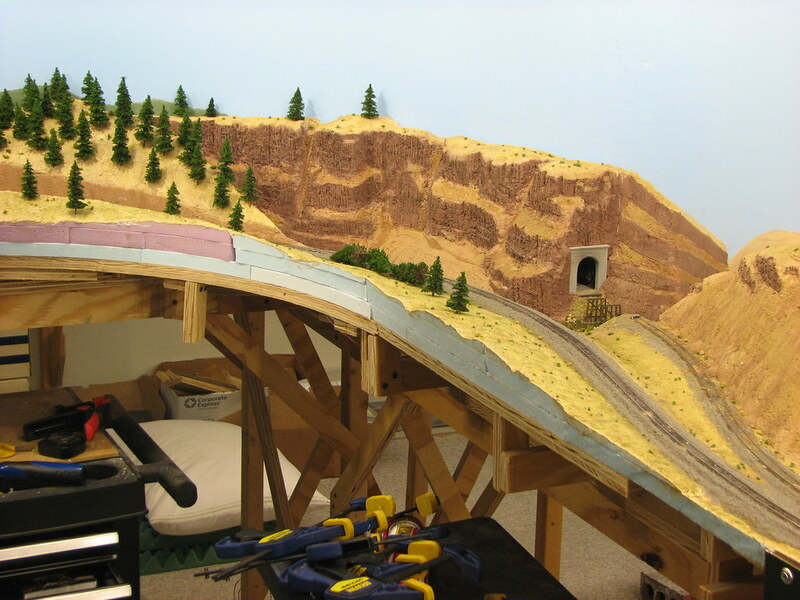 I built this layout completely by myself but thanks to not having cable or satellite TV, progress was steadt. Being a lone wolf is both a curse and a blessing as I didn't have anyone to bounce ideas off or help me, but I also didn't have anyone clouding my vision for what I was looking for in a layout and was able to come up with some nifty solutions because I didn't have anyone telling me the "right" way to do things. First out is the grade coming up from Silvies Yard and around the curve which leads into what will become Emigrant Canyon. 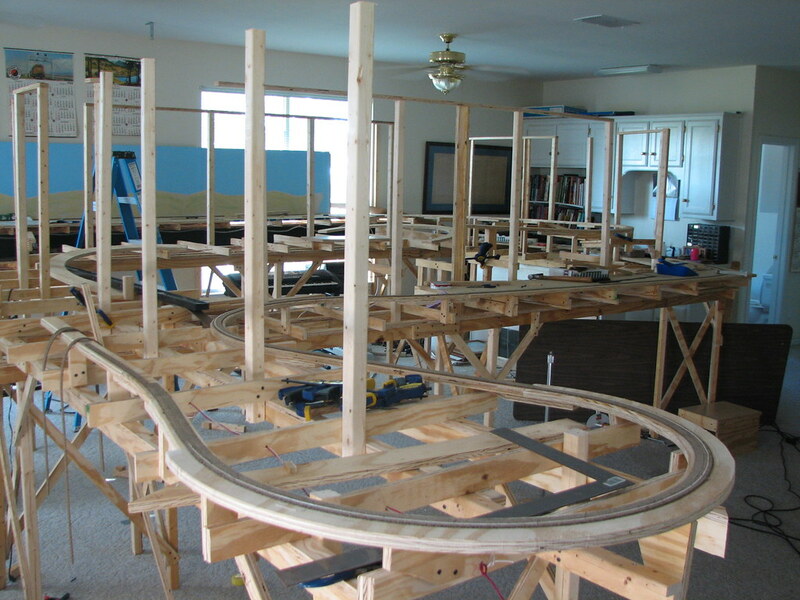 You can see strips of 1/32" balsa on the outside of the curves which will provide superelevation when the track is laid. Ultimately I decided this curve was too tight at 18" radius (tightest on the layout) and later replaced it with a 21" curve which was well worth a small amount of lost aisle space. Next is both ends of the layout - stacked reversing loops. 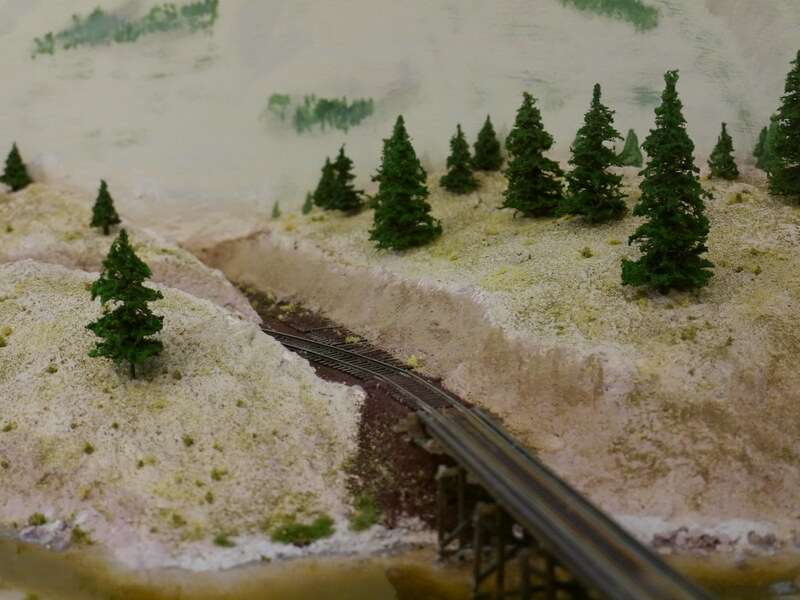 Only in N Scale (okay Z scale too) can you get away with a feature like this. 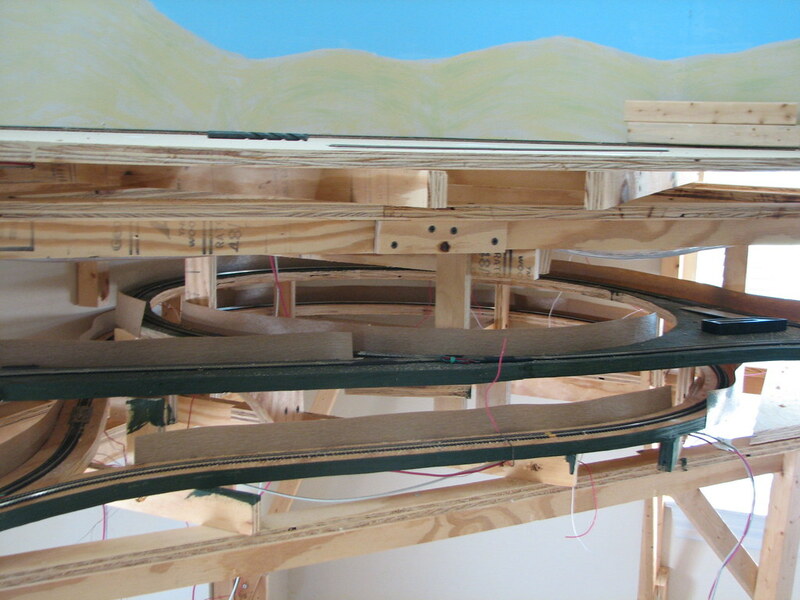 On top is the main layout level which will become a wye for the Monument Yard locomotive facility (still unbuilt), the middle level is the reverse loop beyond the south staging yard, the lower level is the reverse loop beyond the north staging yard. The middle level track extending to the left is a continuous run connection. This is the north staging yard which sits below what is now Monument Yard (largest yard on the layout). The shorter staging tracks are a fiddle yard which allows me to switch out consists for through trains after each session. The two staging level tracks against the wall are the continous run connections - one now holds a loaded coal train, the other an empty. It goes on, but those are the basics that really separate it as a great layout. And, again, the ops scheme, while in infancy, seems about the best I have seen. Only complaints are from whoever draws the helper assignment for more than an hour or so. All other jobs are great mix of road switching or yard switching. I've been fairly satisfied with my layout design overall, with the one glaring exception being the south end staging yard. Here's the scenicked entrance to the NP south end staging yard (called Harney) which is just beyond the south end of Silvies Yard. This location, called Humboldt Jct, is where the GN and NP split at the end of their joint main track through Central Oregon. The line to the left is the GN (all my GN track has red cinder ballast) and the GN staging yard (named Steens) begins around the corner. I'm sure some of you who've followed this entire thread were starting to wonder if the layout had any structures. 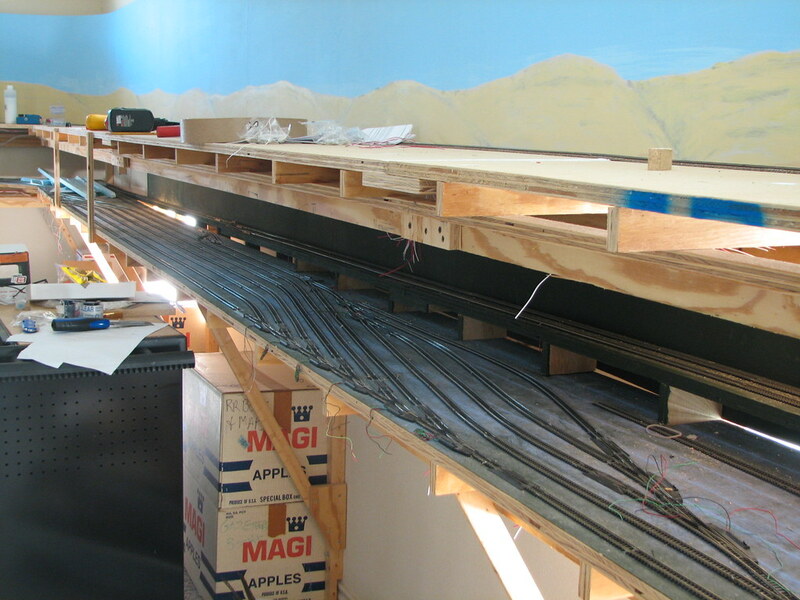 Here's what you see as the staging yard leaves the scenicked portion of the layout. The problem with this design is that this location is way too low for a duckunder so you're forced to watch your train's progress through this hole in the backdrop and hope you judge correctly that you're not running out the other end of your track. The alternative is to backtrack a good 75 feet to the other end of the staging yard so you can watch your train closeup. Intially I just told crews, "Don't worry - you'll fit, just pull down so your caboose clears the north end and you'll be fine." I don't know about you, but when I'm given an instruction like that from a layout owner it's not exactly reassuring, especially when I have to qualify the statement with, "One of the staging tracks is significantly shorter than the others, so don't forget that was I just told you doesn't apply to track one." At any rate it became very obvioius with the first session that I needed to come up with a better solution. My wife provided the inspiration when she started bugging me about getting rid of our old unused TV that's been cluttering up the house for several years. It dawned on me that I had a perfect use for it and ordered a couple cameras for $40 each (they are about the size of a triscuit) (http://www.amazon.com/gp/product/B000GIP98Y/ref=oh_details_o05_s00_i00?ie=UTF8&psc=1). 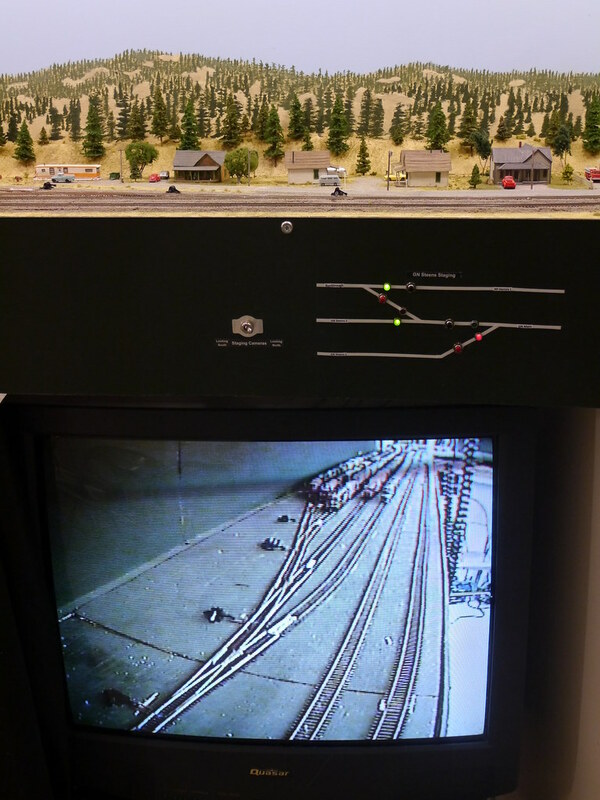 Now crews can watch their progress on TV with both a north and south view of staging. 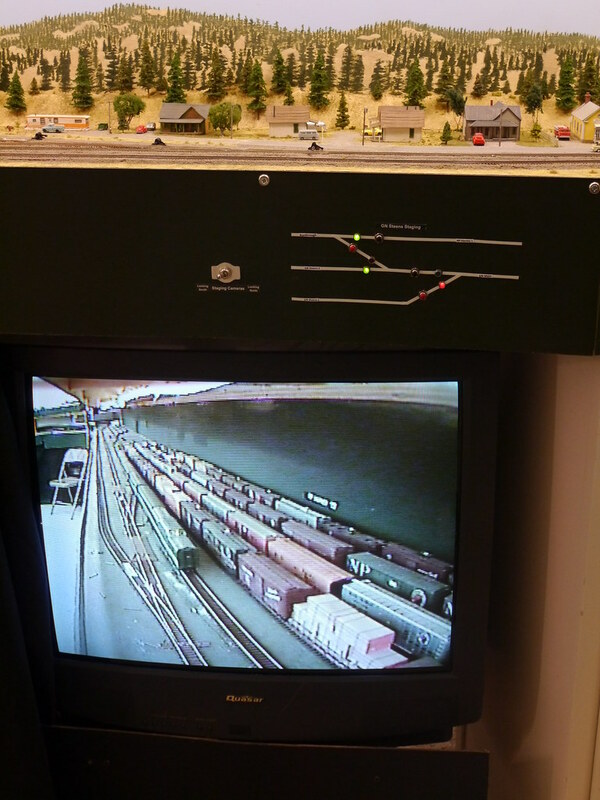 And I installed switch controls for the north end of the GN staging yard above the TV. While I'm at it, here's a photo of the south end of the staging yard. The train lineup is a little unusual with all the run-through WP and ATSF power, typically it's a little more balanced with NP power. The first two tracks against the aisle are the GN staging tracks. The rope light adds just enough light to see what you're doing without drawing attention away from the much more brightly lit scenicked layout. Here's my current project - a rather large canyon called Picture Gorge. 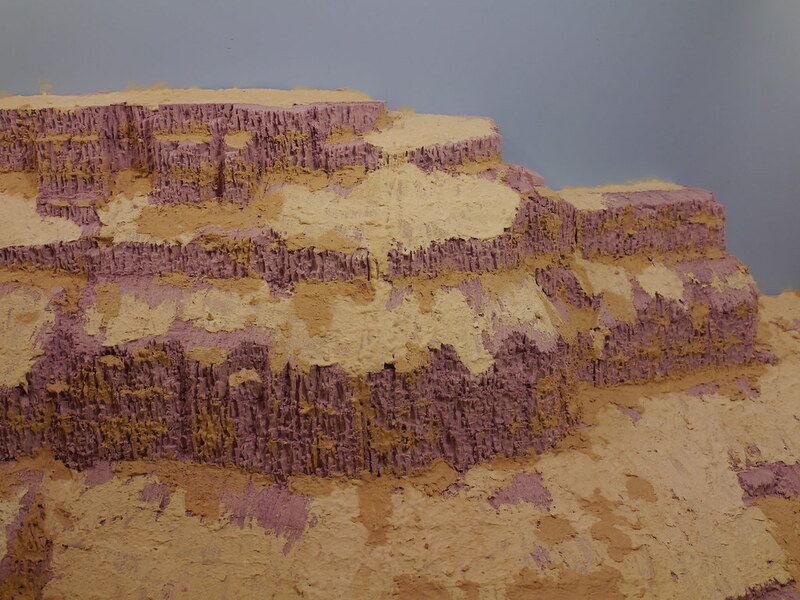 I'm carving pillar basalt typical of Eastern Oregon out of pink foam. This first shot doesn't look like much as I begin building the basic form using layers of foam. Farther along in the process (taken merely minutes ago) I've completed the layers, finished most of the carving, and filled some of the joints with sculptamold. 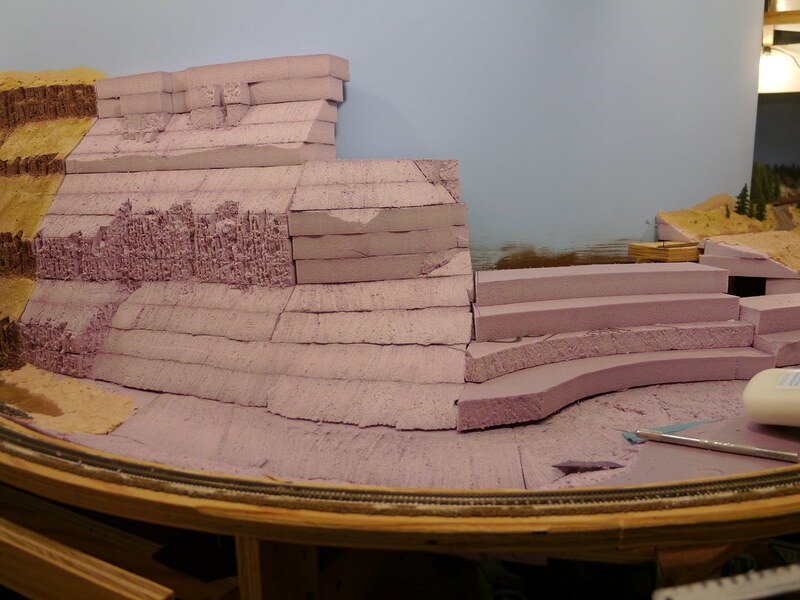 Next step will be cleaning up the carving, then painting, talus, foliage, streambed detailing, and then water. 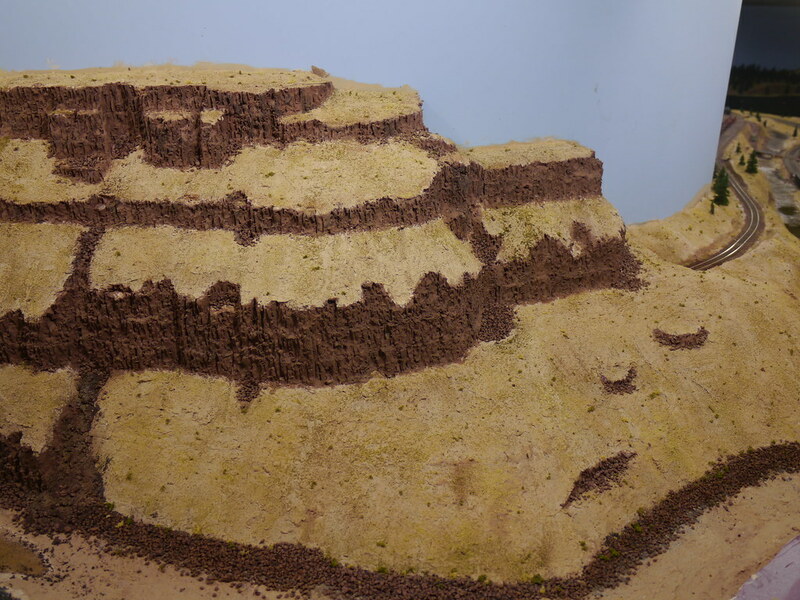 Then I begin the other side of the canyon - when complete you will be looking down a two sided five foot long, two foot high (320 scale feet!) canyon with the track winding through S curves. This is a very time consuming process, but enjoyable, and should provide satisfying results despite my extremely limited artistic skills. Good progress over the weekend with my canyon project. Now it's time to start the opposite canyon wall. The track in this photo is the end of the Oregon & Northeastern and serves as a tail track for the log reload.